Montana and Marino, together again. Famed 49er Joe Montana is returning to quarterback one last game at Candlestick Park. The NFL Hall of Famer is commemorating San Francisco‘s former stadium with one final football match that will bring together some of the team’s greats. 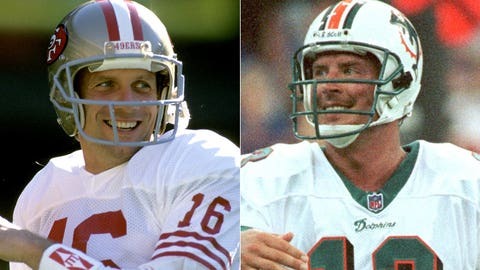 According to 49ers.com, Montana will be joined by fellow former 49ers Jerry Rice, Roger Craig and Dwight Clark to play a flag football game against fellow Hall of Famer Dan Marino and other ex-NFLers on July 12. Tickets for the event go on sale May 10. As 49ers fans fondly remember, Montana led San Francisco to victory against Marino and the Miami Dolphins at Super Bowl XIX in 1985. It’s a fitting sendoff for the famed stadium, which started out as the home of the San Francisco Giants MLB team before housing the 49ers in 1971. Afterward, Paul McCartney is slated to play Candlestick Park’s last concert on Aug. 14, 48 years after the Beatles performed their last concert at the same venue in 1966. The 49ers will kick off their inaugural season at Levi’s Stadium in Santa Clara with a preseason game against the Denver Broncos on Aug. 17.